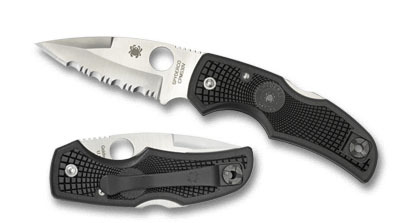 For EDC use, the Spyderco Native is kind of like the edged equivalent of the S&W Model 640: they’re both meticulously well-made and comfortable to carry. And both pack a mean punch, too. Like the 640, the Native is so comfortable there’s no reason you won’t have it with you when you need it, but it’s probably not the tool you’ll want in your hand for heavy or extended use. It’s not really made for that . . .
Spyderco cut a few corners to keep this knife lightweight and affordable: the blade pivot is secured with a rivet instead of a tiny Torx bolt, and the one-piece grip body is more flexible FRN instead of rigid G10. Great knife, and I agree it is better off loose and deep in your pocket. Mine is all black… DLC combo blade. I’ve always liked the “aggressive” shape of the blade and the swedge cut into the spine. It just looks “right” with serrations, IMO. It’s the only serrated blade in my collection of about 50 spydies. Sudden love? To my knowledge, Spyderco has had a very loyal following for a long time. The GENIUS of Spyderco is to make a wide variety of models (the Baskin Robbins of knives), at a high level of quality for a reasonable range of costs. Go on the knife forums, and you’ll find Spyderco owners doing all the marketing for Spyderco. They are very vocal fans. Spyderco is also VERY responsive to their customers. They listen and then give’em what they want. Brilliant. I got my first Spydie in 2010 – a Caly 3. I wasn’t even a “knife guy.” Three years later, and I’ve got over 50 Spydercos. The only non-Spydie knife I have is a traditional Kabar. Spydercos are what we’ve gotten to review lately, but we’ve got a pair of Cold Steels in the works. I’m angling for more fixed blade to review, but it’s probably going to be a while before somebody sends us a free Randall to play with. And this makes me very sad. In the meantime we’re hoovering up every blade we can review. All the kitchen guys I know like them because they are easy to sharpen, easy to use with gloves, available in a variety of bright, non threatening colors and cheap. And mass produced, so no one cares when you lose it or break it or ruin it. i love my Natives, but at this point the Native 5 is going to see more use than the rest of the lot. Tip up only, no thanks. Why do they do that? I got a Meercat 10-15 years back; small, cool, really cute unlocking mechanism. My only complaint was that short and stubby doesn’t work for narrow openings when I want to insert the point to cut something using the handle as a lever–like a zip-tie. Ꭺ regrа básica doo tratamento é a jejum ԁa droga. Вы очень точно разъяснили проблему) Этот обзор неповторим! Ваш интернет-сайт по-настоящему полезен:) Благодарю покорно! the enduring dependents of a wrongful death victim. recommend him/her to visit this web site, Keep up the good job. Imagem 17 – Banco bem como tinha esculpida em Nanoglass. be built online so that your company grows stronger. Ao inverso do grânulo, dureza é mínimo persistente. The clearness to your publish is just great and that i could assume you’re an expert in this subject. imminent post. Thanks 1,000,000 and please keep up the gratifying work. be happy. I’ve learn this post and if I may just I desire to recommend you few fascinating issues or advice. What’ѕ up, just wanteԁ to mention, Ι loved this blog post. Some really seⅼect posts on this site, saved tо my booҝmarks. Thanks for sharing your thoughts on targeted visitors. I am impressed withh this site, real I am a big fan. can pick the one that suits your preferences. However, you will certainly have to play numerous PvP matches to unlock the Medal Breast. drowned. Now, register it there as well as appreciate it on COMPUTER. to connect and also do missions, develop, as well as check out with each other. the Globe to join us in the pursuit of joy, liberty and the American Dream. with to solid team fights stone’s throw off. Get it right here if you do not have it yet. From here Luster and Heart of Gold (HoG) round out your core items. Roslin (Roslyn)Chapel is not too far from below either- 10 miles. Wow, amazing blog format! How lengthy have you ever bden running a blog for? Hello, after reading this remarkable piece of writing i am also glad to share my familiarity here with friends. of writing? I have a presentation subsequent week, and I’m at the search for such info. Solving problems and discord resolution for children need to commence being taught early on on.